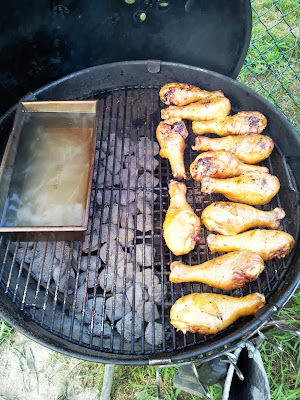 I picked this recipe from Weber’s Charcoal Grilling: The Art of Cooking with Live Fire last week, because I wanted something on the grill, but didn’t feel like going out to the store to pick anything up. 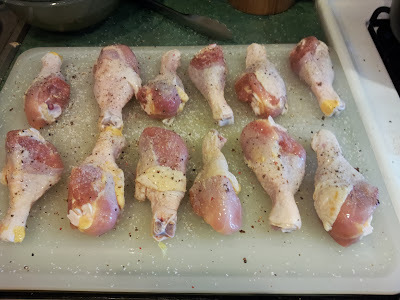 So I defrosted some chicken legs the night before and set to preparing this. 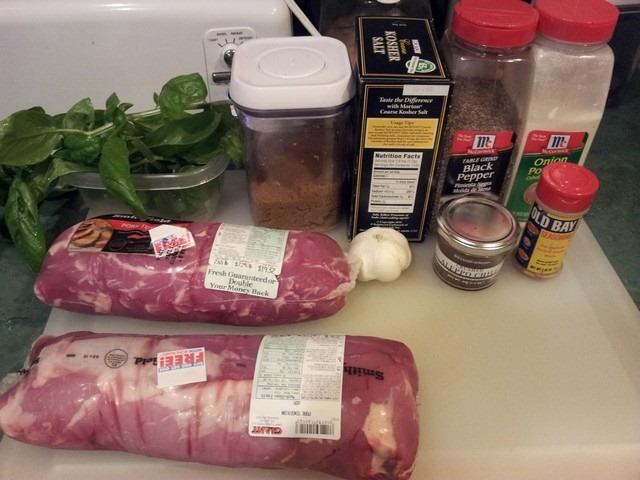 This is a relatively quick recipe to prepare for. 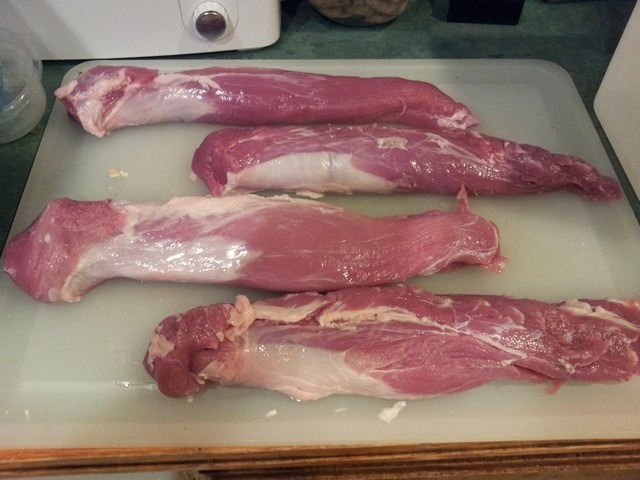 Total time from unwrapping thawed legs to plate was about 5.5 hours. 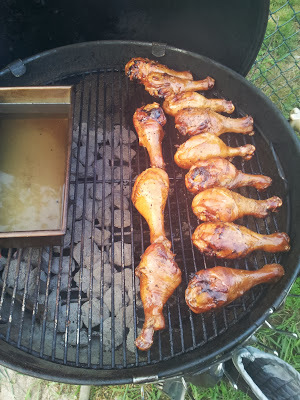 The majority of that time (4 hours) was the brine time for the chicken legs. Let’s move on to the cook! 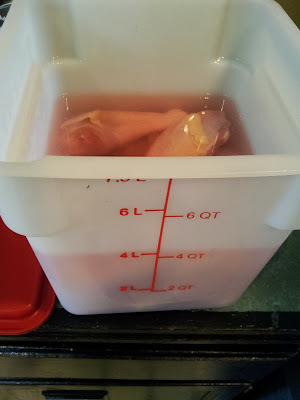 Step 1: Brine the chicken for 4 hours in the brine mixture and place in the fridge. 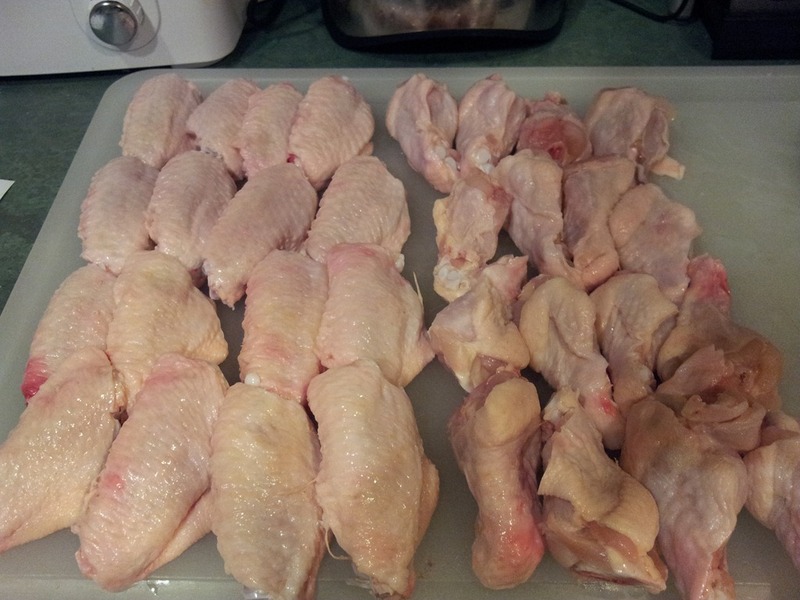 Step 2: Remove chicken from brine, rinse off, and pat dry with paper towels. 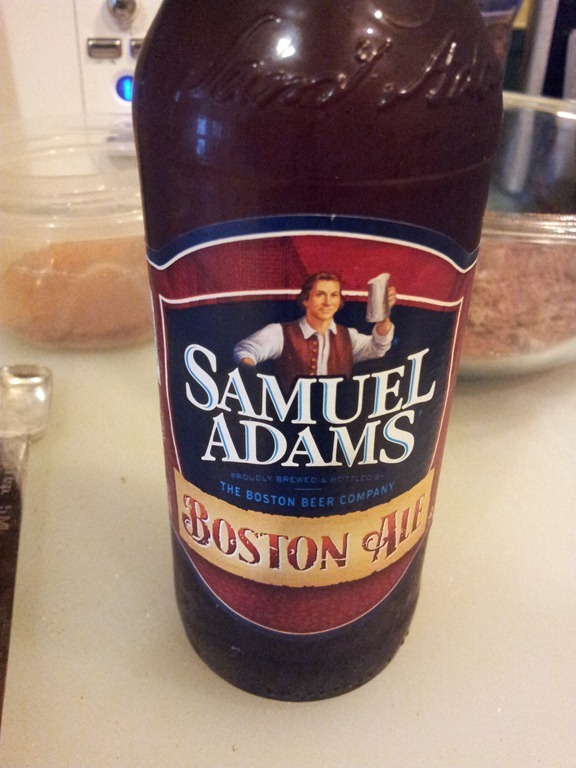 Then liberally season with seasoning blend. 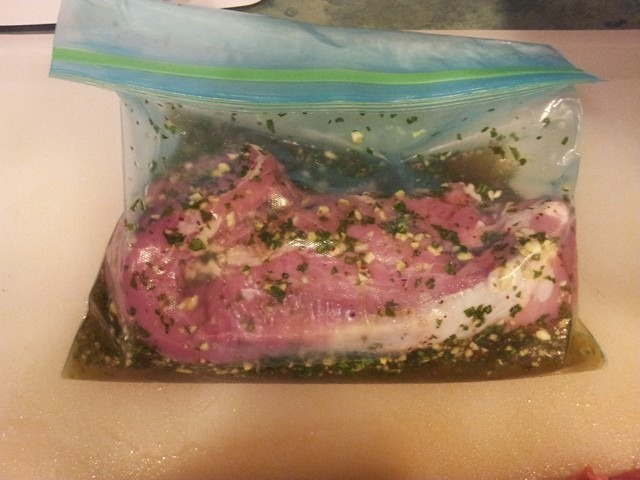 Step 11: Pull and let rest for 15 minutes. I made some sautéed vegetables and brown rice with a Moscow Mule. Excellent! Chicken had a bit of heat to it, a little too much for the kids, but me and the wife loved it! 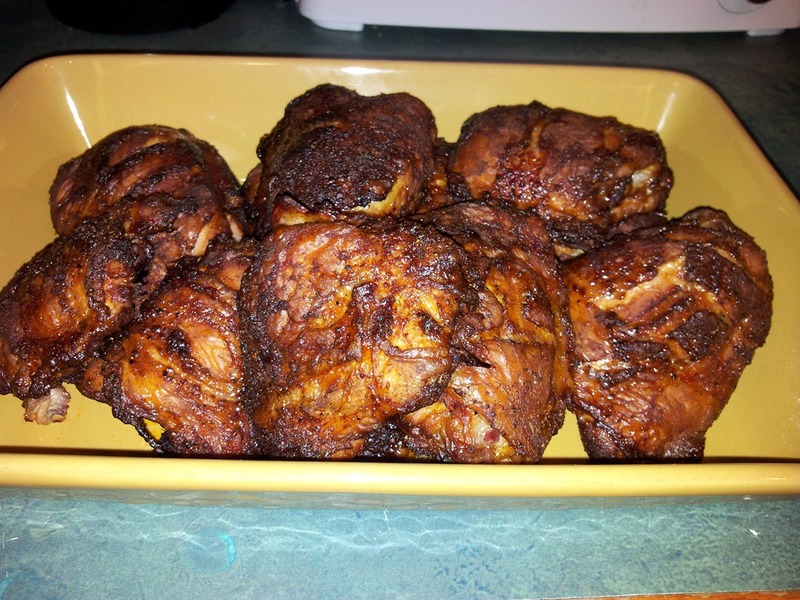 I originally came across this recipe on Pinterest from the chubbyvegetarian blog. As soon as I saw it I had to give it try. I did and it came out wonderful and my family loved it! 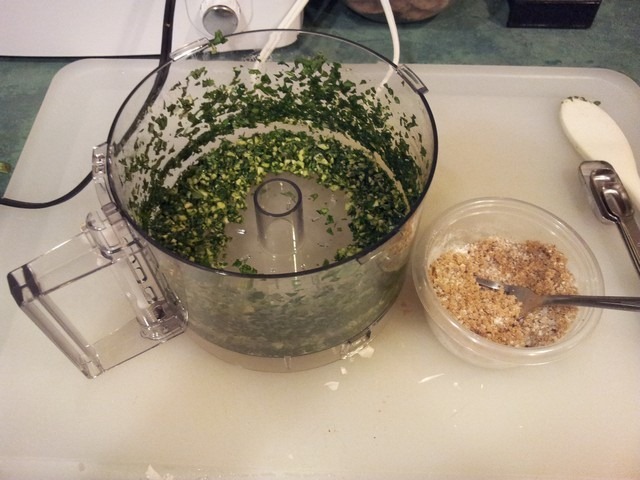 Step 1: Place all ingredients in food processor. 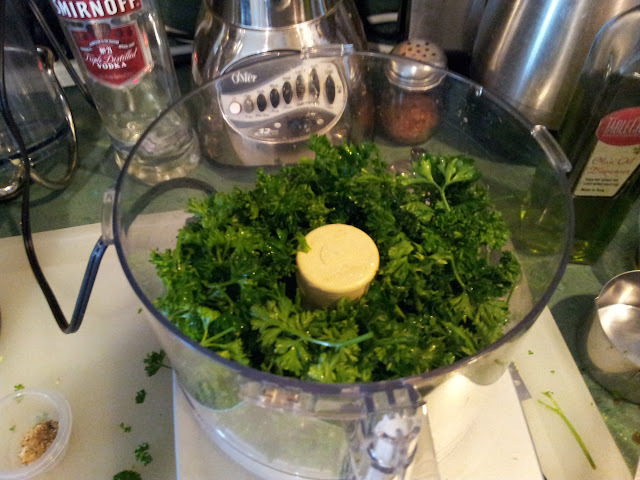 Step 2: Run food processor until everything is blended fine. 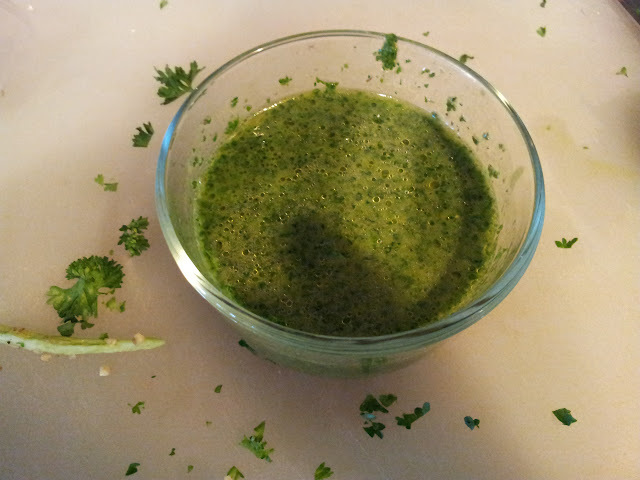 Slowly add oil while food processor is running until the mixture is smooth. 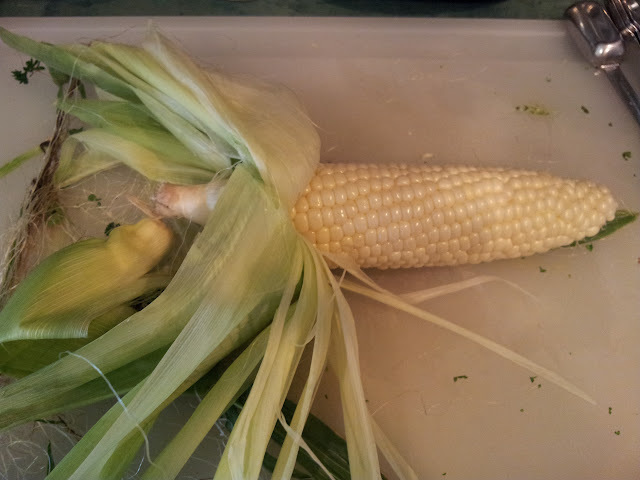 Step 3: Shuck your corn and remove as much of the silk as possible. Sometimes running under cold water while pulling can help get rid of the most stubborn strands. 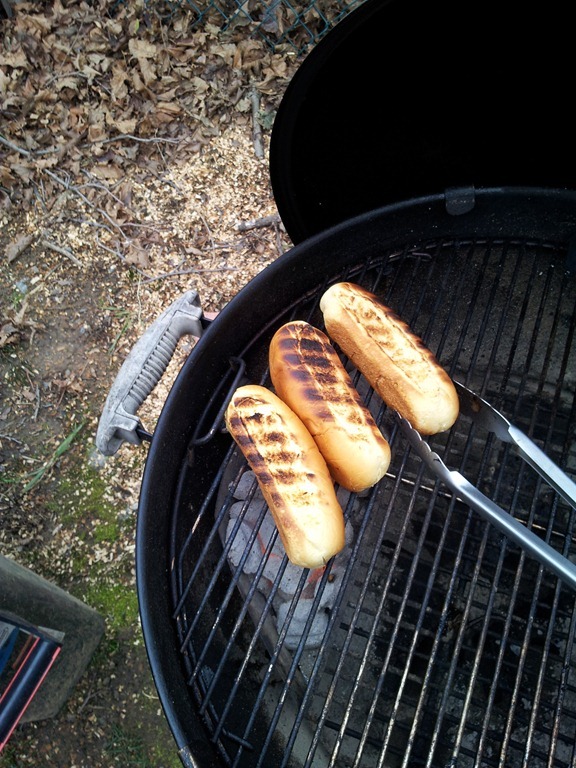 Step 4: Start a medium hot fire on your grill. 1 chimney’s worth of charcoal should be fine. 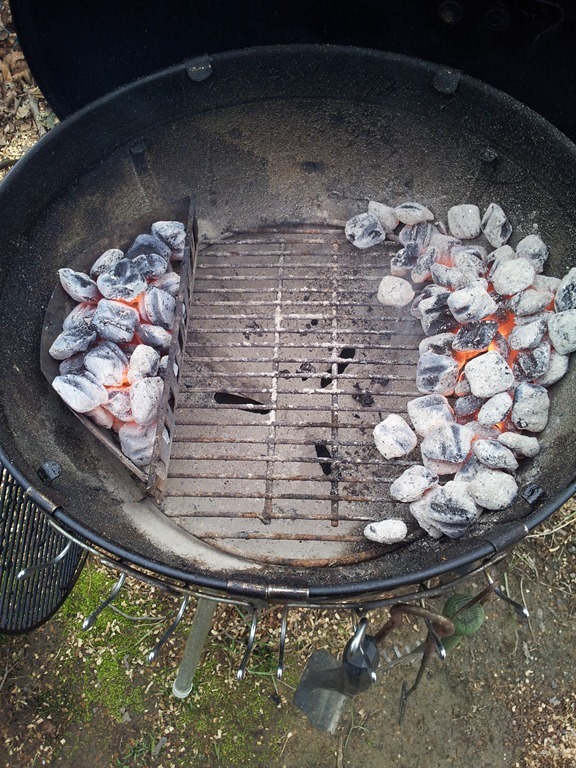 After coals are ashed over, spread into a layer 1 coal thick. 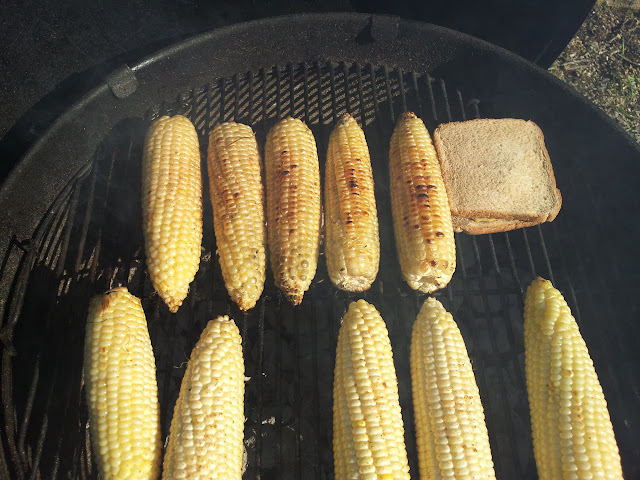 Place corn directly above the coals. 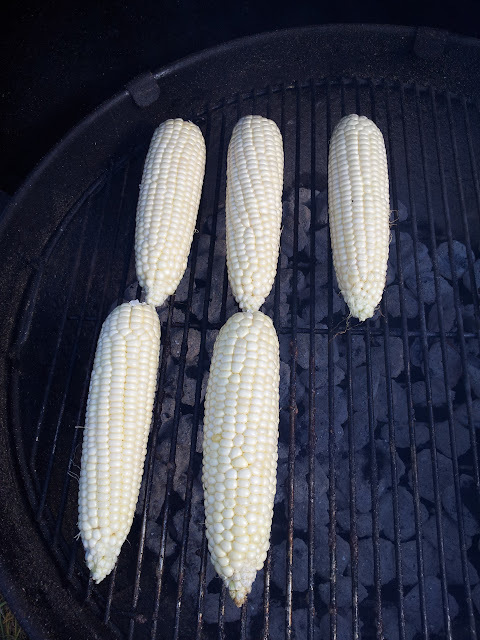 Step 5: Grill the corn directly over the hot coals for approx 5 – 10 minutes per side. When the kernels start to lightly brown it’s time to turn and rotate the corn. Make sure you don’t burn it. 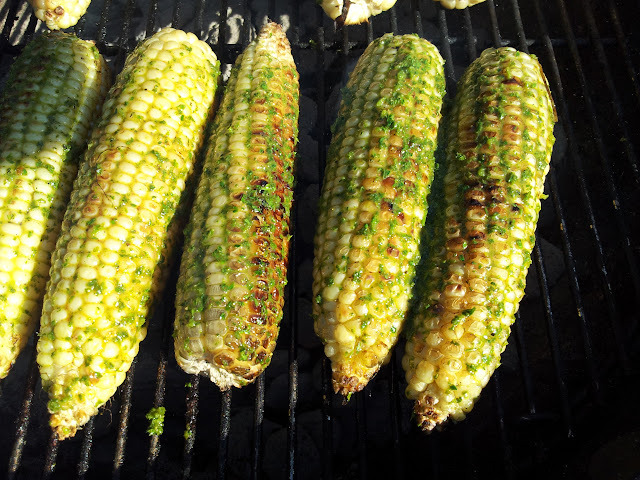 Step 6: Once corn is nicely grilled all over, liberally brush on the Chimi Churri sauce. 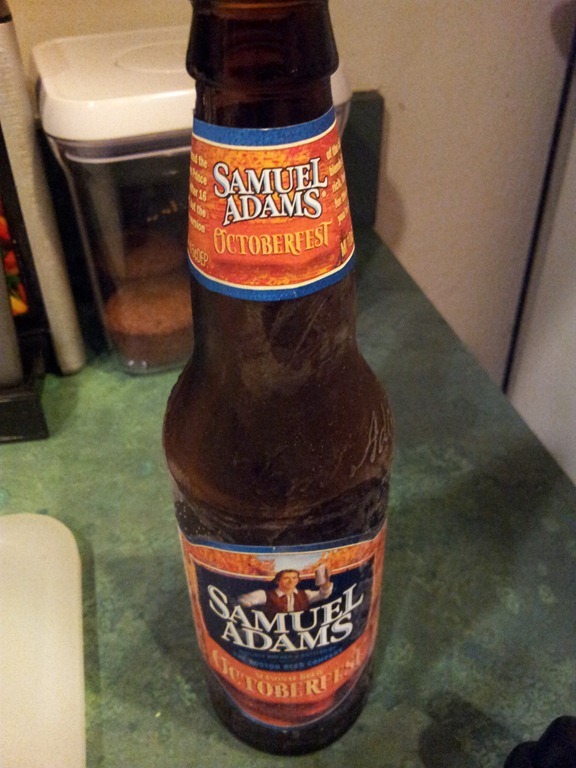 Goes perfect with a cold beer! It’s the first of the New Year and I had to create a bit of Summer. 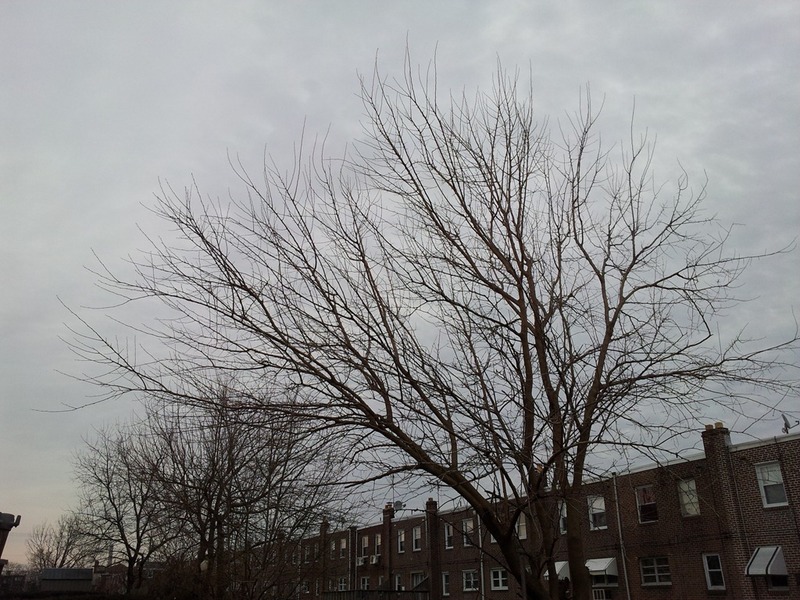 Right now it is 35 degrees, grey, and a bit dreary here in Philly. But that doesn’t have to stop me. Mind you, my wife and neighbors are sure I’m insane. 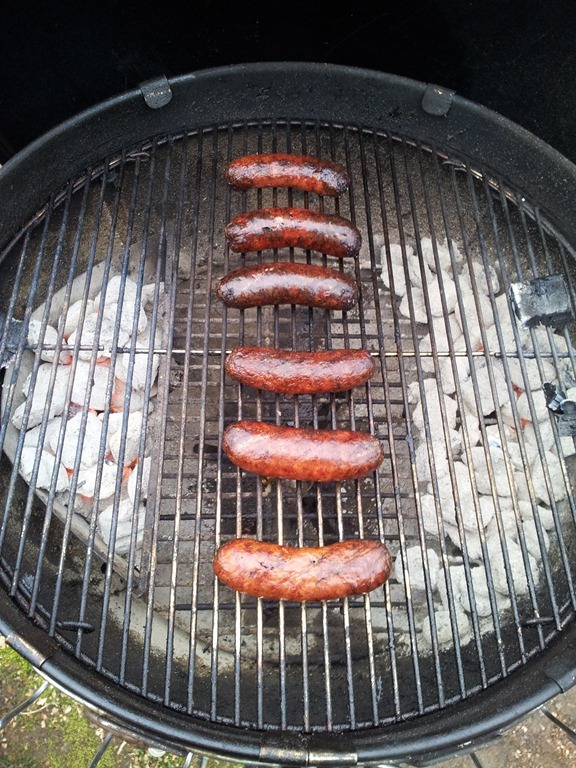 Besides, its been a couple of months since I’ve been able to grill. 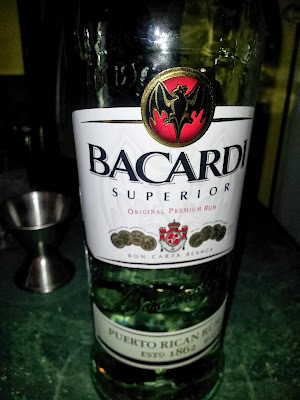 Let’s see Hurricane Sandy, an unnamed storm, traveling to Detroit and Chicago for work, a couple of bouts with some good chest colds, and voila!, There goes your time. 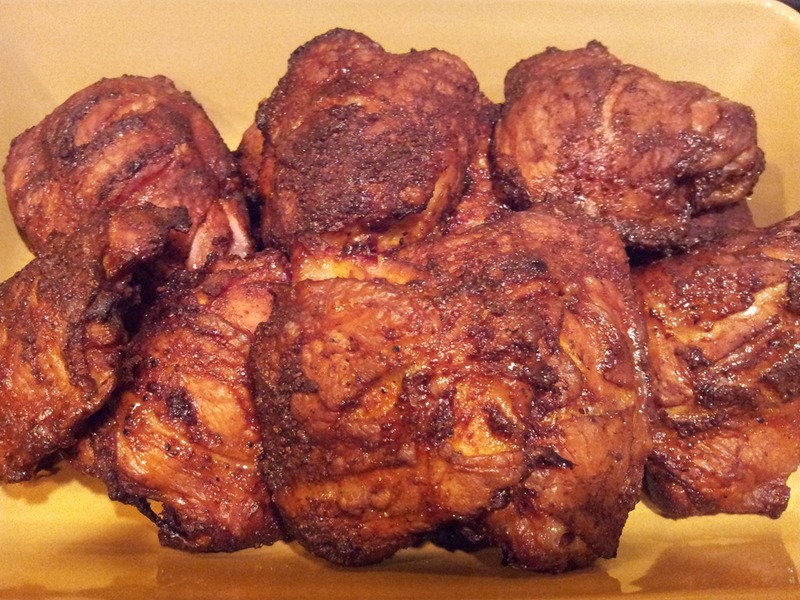 Since I only thought of barbequing this morning, I didn’t have time to brine the thighs, so I used this basic rub and let it sit for a couple of hours while I grilled some bratwurst and potato rolls. 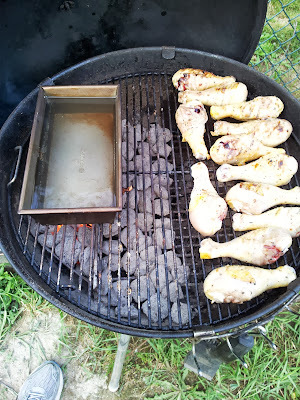 Also, I will do a complete slow and low cook without starting the chicken directly over the coals first. This way they get a chance to absorb as much of the cherry smoke as possible. 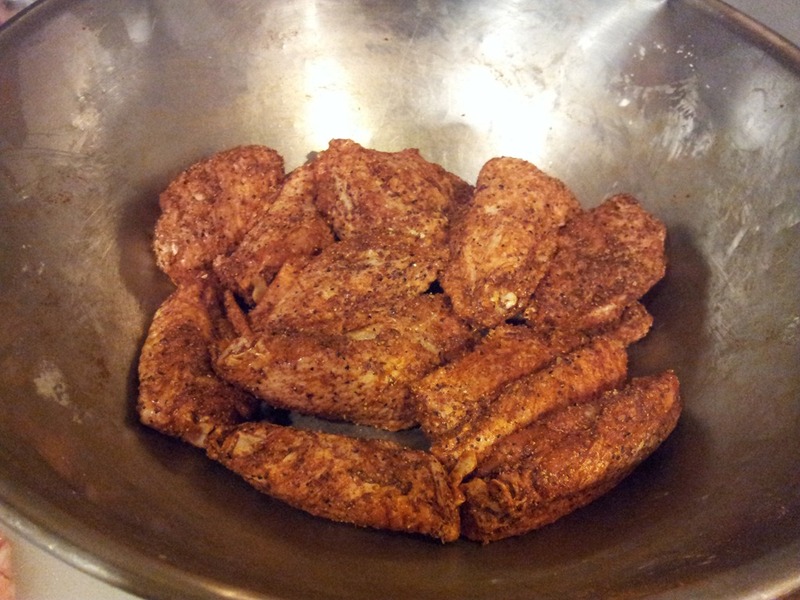 I rubbed the thighs with the EVOO first then liberally sprinkled and rubbed in the dry rub. The rub is very basic so go with as heavy as a hand you like. The temperature outside is a bit on the cold side, 35 degrees and about 10 mph wind. So I don’t have to worry about temps getting away from me at the beginning of today’s cook. 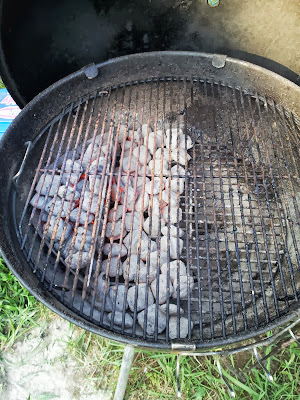 I lit one full Weber chimney of coals that I split between a weber basket and the rest heaped against the other side of the kettle. 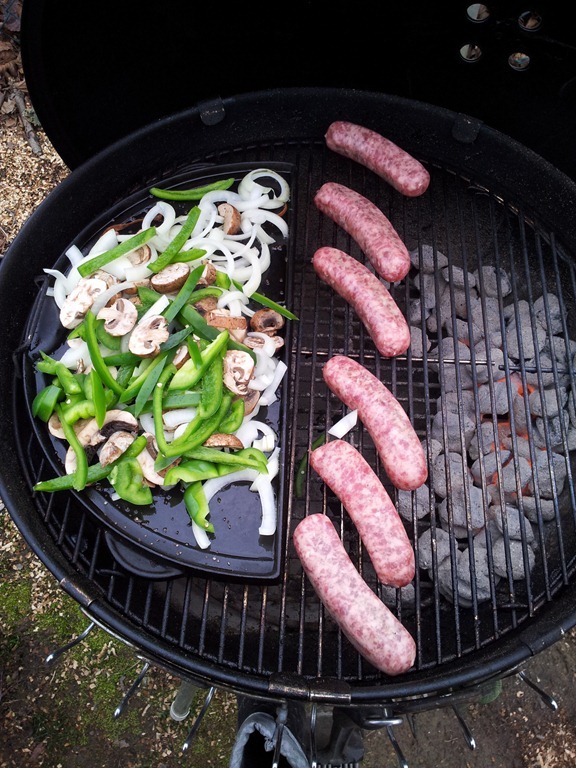 This allowed constant heat for the cast iron griddle for the onions, mushrooms, and green pepper, as seen below. I used a bit of smoked sea salt and dried porcini mushrooms while cooking the vegetables. 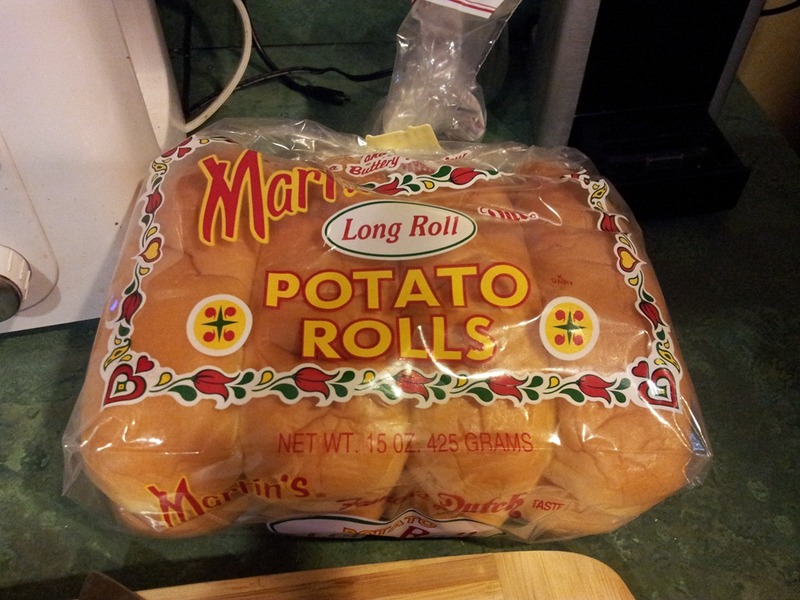 Best Potato Rolls in Philly! At about 30 minutes later in I added in 15 additional unlit briquettes to ensure I had enough heat for the planned cook time of 1:45 minutes totals. Thighs came off and were perfect. Meat fell off the bone. 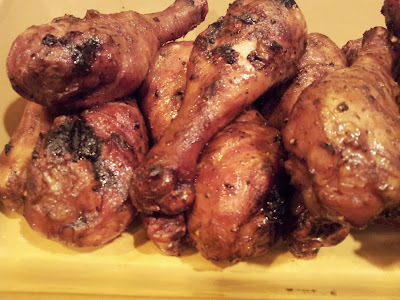 They went great with a 1:1 mix of Sweet Baby Ray’s and Srirachra Chili Sauce. 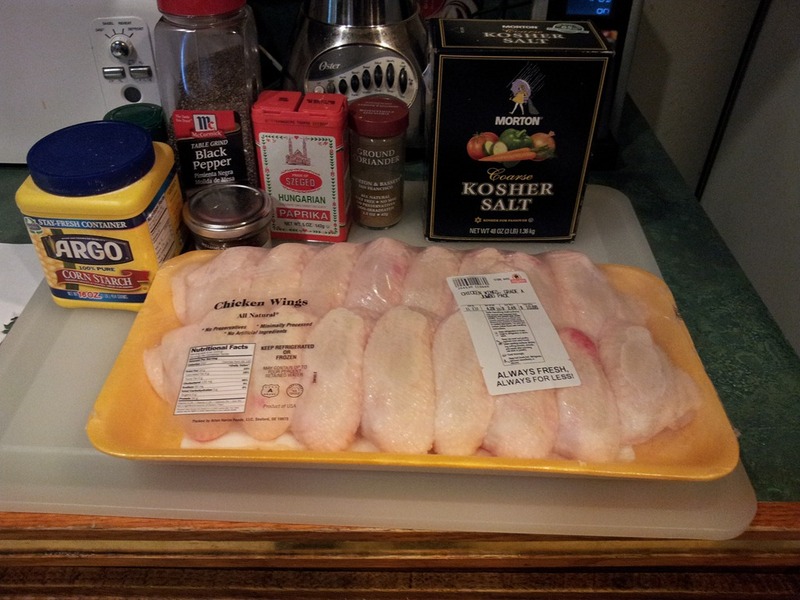 After my recipe regarding the crispy grilled chicken breasts, I decided to work on a similar recipe for wings. But the past 3 weeks have been a bit hectic here in Philly; a trip to DC for work, then Hurricane Sandy, then I caught a nasty cold during the Hurricane, and now a Nor’easter is blowing through with rain and snow tonight. So, since I had this recipe on deck the week before all of this started, I’m finally posting it. 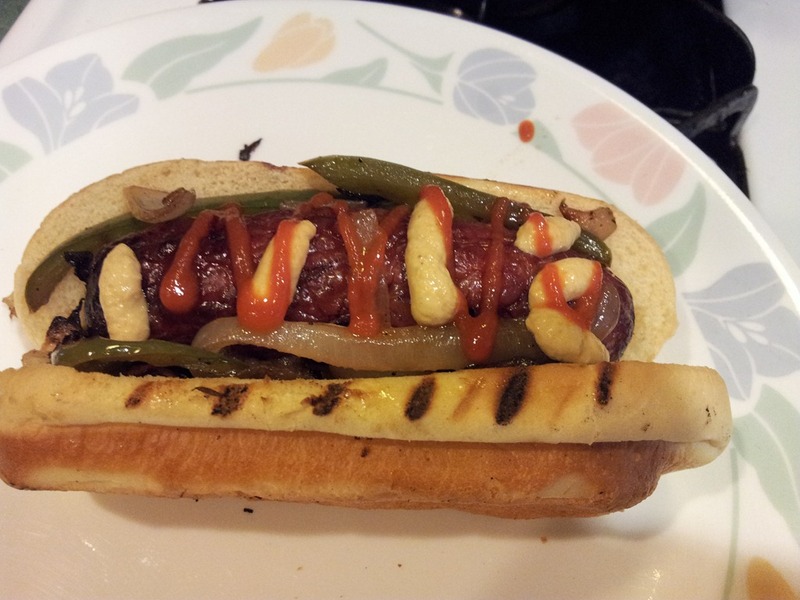 This is a variation of a recipe from Chef John of AllRecipes.com. His stuff is usually pretty good. I had no problem changing this and adapting it to my purposes. Let me give you the run through and play by play. 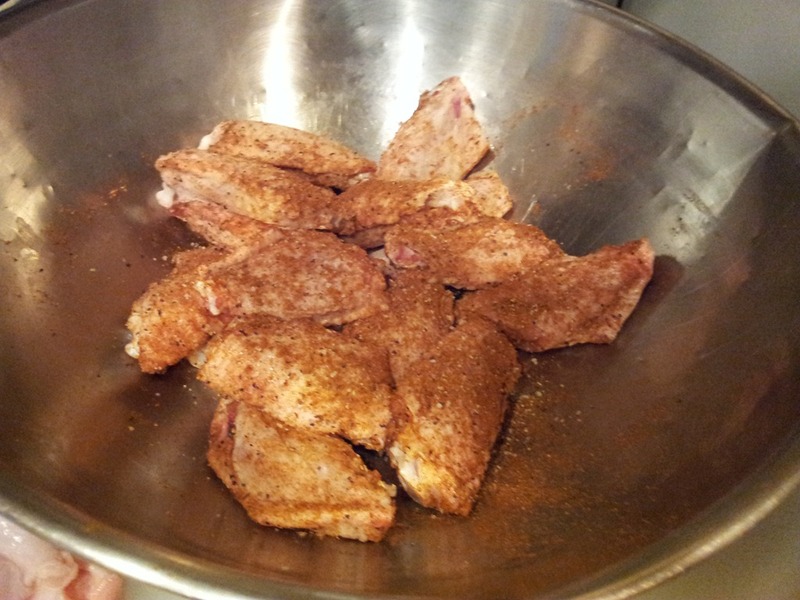 Add all the dry ingredients (except the corn starch) together in a small bowl and mix thoroughly. 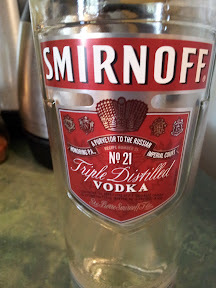 I used a small whisk to mix and blend the ingredients together. Nothing like a bowl of freshly mixed spices! Here I’ve split the wings into the drummettes and flats. I’ve tossed the tips, as I never really use those for anything. Some people like them I guess, but as for me, NOPE! 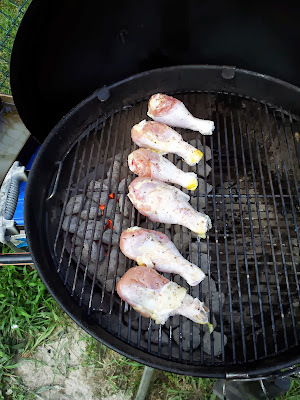 I’ve lightly coated the wings with olive oil and rubbed them down with my fingers. 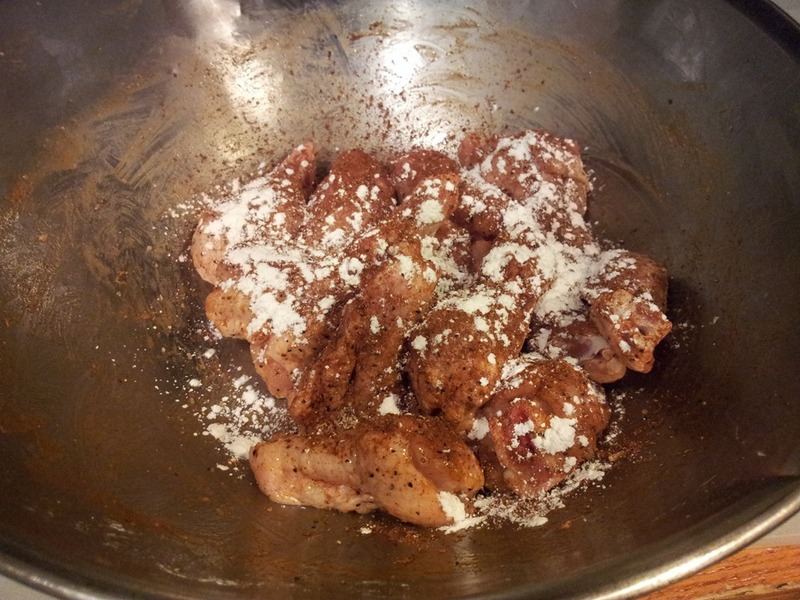 In this shot I’ve just begun seasoning the wings from above. 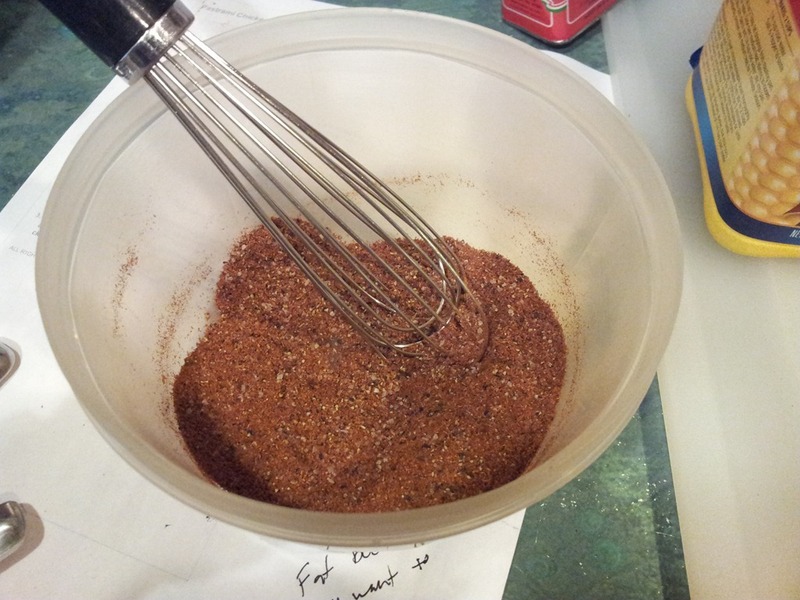 I usually take a few fingerfuls of spice mixture and “Make it Rain” from above. With this recipe you’ll season the wings twice. 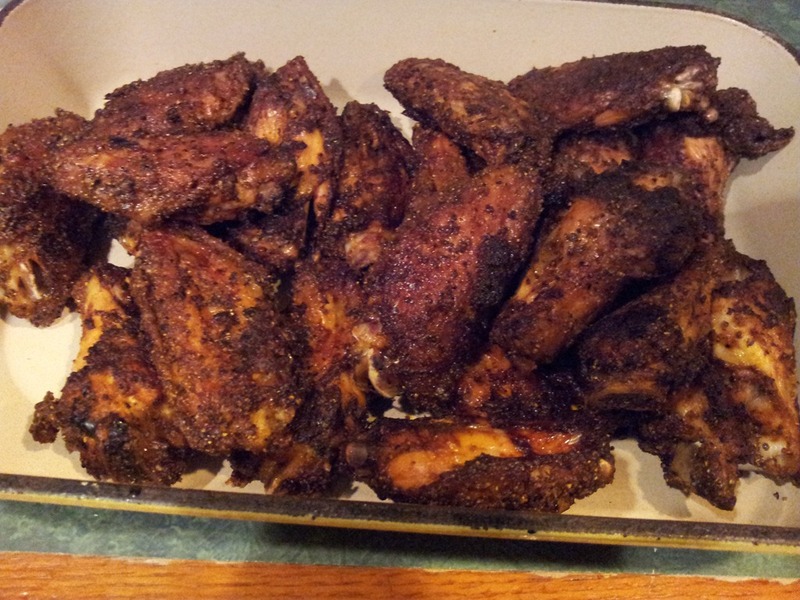 So be sure to make sure you pace yourself with the rub so you have enough to last 24 wings twice. I just flipped these in the bowl a few times and they were evenly coated. 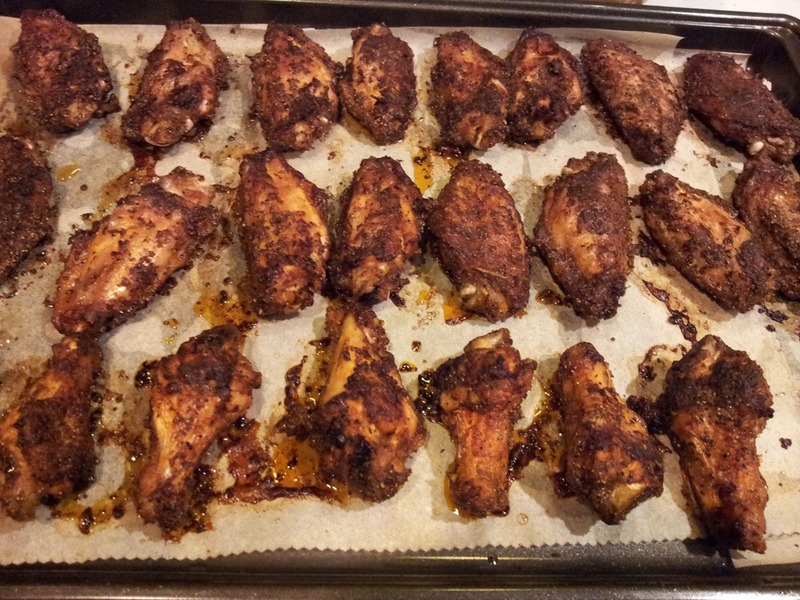 Here’s what the wings look like with the final coating of spice and one last toss session. Cook these at a medium-high heat 400 to 425 range worked for me fine. I used some parchment paper to keep them from sticking to the pan. 20 minutes into the cook, flip them over and cook on the other side. In the picture above you see them just as I was about to bring them to the kitchen. Let them rest for about 10 to 15 minutes. The juices will re-distributed and the skin will crisp up a bit. These were unbelievably good! 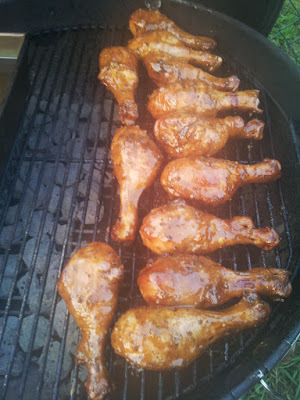 I’ve since made them twice since I first tried this recipe and have been able to produce consistent results with them. The whole family blew through these in about 2 days. But it was well worth it! Try ‘em out and let me know what you think!